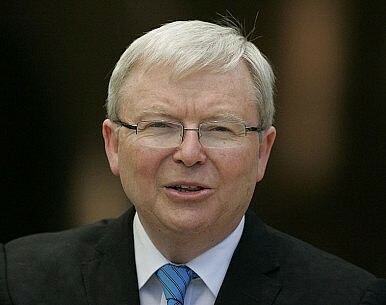 Reinstalled as prime minister, Rudd warns on slowing China growth and calls on Australia to diversify its economy. Australia’s second-time Prime Minister Kevin Rudd has wasted no time hammering a nail in the coffin of the China boom after ending the political career of his predecessor. Making his first press statement Wednesday night after successfully challenging Julia Gillard for the Labor Party leadership, the Mandarin-speaking Rudd said Australians must diversify away from the Middle Kingdom. Rudd attracted criticism during his previous stint as prime minister for bypassing Japan but visiting China in his first major trip, and ironically he was scheduled to visit China on Thursday afternoon to speak at a Beijing summit. Wednesday’s resignation of Treasurer Wayne Swan amid other senior departures has left analysts questioning the future direction of the world’s 12th-largest economy, which has enjoyed 22 consecutive years of growth. After six years as treasurer, Swan is expected to be replaced by Rudd loyalist Chris Bowen, who will be under pressure to show a pathway to improved government finances. Yet Rudd gave few policy clues, other than pledging to continue “growing the size of our economic pie, as well as how it’s distributed,” a pledge likely to resonate with the center-left party’s supporters. Nevertheless, after his previous clashes with business, particularly miners, Rudd had an olive branch for business groups. “I want to work closely with [Australian business]….in partnership we can do great things. Business is a group that this government will work with very closely,” he said. Analysts speculated that Rudd may consider changing the nation’s fixed carbon price to a floating rate, along with continuing Gillard’s Gonski education reforms. Rudd was previously criticized for wasteful spending to boost growth during the global financial crisis, but he said the nation had avoided “mass unemployment”. Early indications from the financial markets were positive for the recycled leader, with the Australian dollar gaining ground and stock futures advancing slightly following an end to the leadership speculation. “The only thing brokers and traders could say is there’s a slight relief that the leadership is over, they hate uncertainty, but the general attitude is an early election is all they want to see,” business commentator Janine Perrett told Sky News Australia. The message from business leaders was the same, according to those polled by the Australian Financial Review. “We need an election over and done as soon a possible – so we can get business investing and employing people and consumers can get certainty,” UGL director Trevor Rowe told the financial daily. “The urgency of this is that there are external factors impinging on our country such as the slowdown in China, which affects our commodity exports; the dramatically falling Australian dollar and the adjustment process we need to go through on that front; and over the past few years we’ve re-regulated the economy,” he said. Business Council of Australia chairman Tony Shepherd told the newspaper it was time Canberra returned to “governing the country for all Australians”. “We’ve got softening confidence and a weakening economy and this is not helping,” he was quoted saying. With an election expected to be called soon, will Rudd make the “tough decisions” to allow Australia to ride out China’s downturn? The Reserve Bank of Australia cuts interest rates to a new record low.